When you say “daiquiri,” most people think of a frozen blender drink — frequently strawberry-flavored, and with the reputation of being a “girly” cocktail. Hence, a drink that real men eschew (if we’re allowed to say “eschew” and “real men” in the same sentence). 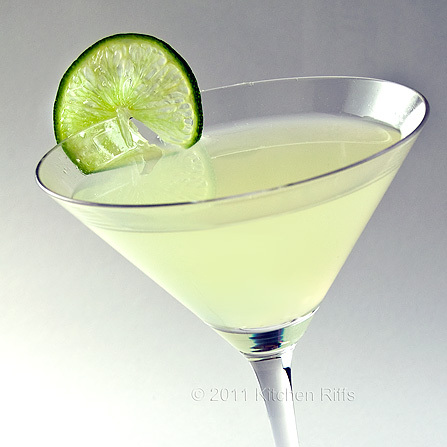 Yet the daiquiri was a favorite drink of both President John F. Kennedy and writer Ernest Hemingway. Nobody would have dared question the macho credentials of either man (try it with Hemingway, and he’d probably have dragged you into the boxing ring). Those guys were drinking the classic daiquiri, which is nothing like the frou-frou concoction commonly served today. The classic daiquiri contains white rum, freshly squeezed lime juice, and just enough sugar (usually in the form of simple syrup) to tame the sourness of the lime. The drink originated in Cuba about 1900. 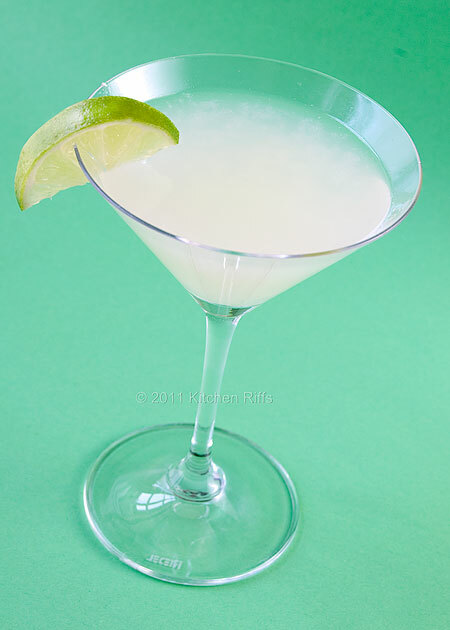 The sad truth is, most bartenders today couldn’t prepare a classic daiquiri even if they wanted to. That’s because bars use sour mix instead of fresh lime or lemon juice. And frankly, I’d rather step into the ring with Hemingway than drink anything made with sour mix. This recipe is the real thing. It prepares one serving that is sized to fill a 4- to 5-ounce cocktail glass. Combine ingredients in a cocktail shaker that is half filled with ice. Shake well for 20 – 30 seconds. Strain mixture into a cocktail glass. 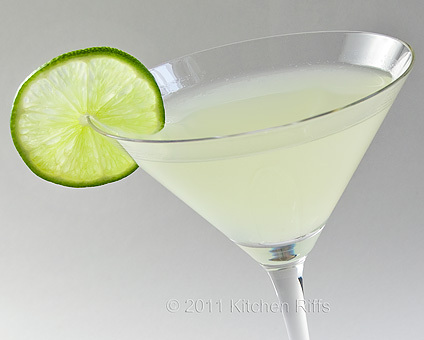 If you want a garnish (I usually don’t), add a lime wheel to the rim of the glass (or toss a lime twist into the glass). I generally use Bacardi white rum when I make daiquiris. Appleton Estate is another good, reasonably-priced brand, although its amber rums are better known than its whites. Speaking of which, you can substitute amber rum if you like. Just remember that amber has a richer, more distinct flavor. If you go this route, skip Bacardi and use Appleton’s. Try the daiquiri first with ½ ounce of lime juice and just enough sugar to give it a pleasant flavor (usually 1 teaspoon of simple syrup). This recipe produces a good, well-balanced drink. Lately I’ve been making daiquiris with an ounce of lime juice and a bit less than 2 teaspoons of simple syrup. 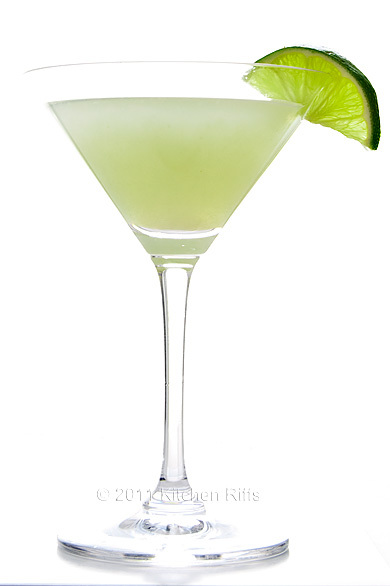 I enjoy the flavor of lime, and I’ve come to prefer a daiquiri that’s heavy on it. But that’s me. You should mix to please your taste. You can use granulated table sugar rather than simple syrup, but it takes longer to dissolve. Simple syrup also adds a bit of volume to the drink, which usually is a good thing. If your drink is too tart, it’s also easy to add a squeeze of simple syrup to sweeten it up. More info in my simple syrup post. Daiquiris weren’t the only drink JFK liked. He was also fond of gin and tonics, champagne, wine, and . . . beer. It’s been reported than Heineken was his favorite brand. Likewise, Hemingway didn’t restrict his imbibing to daiquiris (judging from his work, it appears that his thirst was extensive and inclusive). In his later years, Hemingway become enamored of a variant known as La Floridita Daiquiri (named after a bar in Havana). He also enjoyed a “frozen” daiquiri, but the version he drank was just the classic daiquiri shaken with pulverized ice and served unstrained (not gussied up with strawberries or other fruit). For more information about Hemingway and his daiquiri preferences, Ted Haigh’s Vintage Spirits and Forgotten Cocktails is a good read (and an excellent introduction to some of the more obscure classic cocktails). The recipe for La Floridita is exactly the same as for the classic daiquiri, except you also add a teaspoon of maraschino liqueur. This is a bittersweet, clear liqueur that has nothing to do with the maraschino cherries we put on top of ice cream sundaes (or sometimes use to garnish a Manhattan cocktail). Maraschino liqueur can be hard to track down, since many liquor stores don’t carry it. The brand you’re most likely to find is Luxardo (which is quite good). It was the thirst that was always there. Summer thirst, because it was hot. Heat that crept into your bones. Stayed there, became you. Air conditioner laboring to keep up. It couldn’t. Nothing could. Paris wouldn’t be this hot. Or Venice. Venice would be fine. Harry’s Bar, they know me there. Lots of good times there. The bartenders there know about thirst, how to handle it. Set me up with a cool rum drink. A daiquiri! That would be fine. A couple or three would handle this thirst. Like the matador handles the bull. OK, maybe it’s a good thing they stopped holding that contest. Hi, D! Thanks for stopping by, and the very kind words - I appreciate them. Hi, Lucy, thanks! The frozen daiquiris are good too, but to my taste the classic is so much better. It's one of my top 5 favorite drinks. Hi Anonymous, thanks for the correction! I need to check on this. I just did a quickie search and you're quite correct about the name of the bar - El Floridita - but I'm seeing differing accounts about whether the drink is named El Flordita or La Floridita. Ted Haigh (in his Vintage Spirts & Cocktails is on the "La" side of the question - but I see other people are on the "El" side. Let me do a little research, and I'll update the post when in a bit. But thanks so much for both the correction and the comment. OK, I've run down the origin of the restaurant, thanks in part to a history on its webpage. Today it is indeed called El Floridita. It was originally founded in 1820 as La Piña de Plata. In 1898 it was renamed La Florida, and that was its name when the drink was invented. Floridita is the diminutive of Florida, which is how the name of the drink probably originated. I have a couple of more things to nail down, but I'll add a section to the post in a day or two. Small clarification (without wanting to be doctoring, I'm a native spanish speaker), "Florida" and its diminutive "Floridita" are both female nouns (actually adjectives used as nouns), and as such need "La" as an article. In any case, "Floridata" as in the original post has a typo which is an "a" after the "d" instead of an "i". Now I'll go make myself a Daiquiri. Or two. Hi Anonymous, thanks for catching that typo! Embarrassing - but I've corrected it. And thanks, too, for the grammar lesson1 ;-) Now I need a Daiquiri, too. Or should I make that two? Do you know if President Kennedy also enjoyed a "Manhattan" (with bourbon and sweet vermouth, bitters and a cherry)? Many thanks. I also know that aborad the Presidential yacht, the "Honey Fitz" I helieve he enjoyed something called a "Bullshot" or some similar name. I am not sure how it is made but just a piece of trivia for those who may be interested. Hi Henderson, I don't know if Kennedy enjoyed a Manhattan or not. Terrific drink, though, and one of my winter favorites (I prefer mine made with rye). A Bullshot is essentially a Bloody Mary, except you substitute beef broth for the tomato juice. Thanks for your comment.